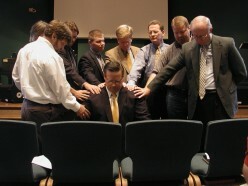 Pastor Edwards’ installation in August of 2003. “Presbyterian” refers to the form of government under which the church functions. GPC is “presbyterian” because it is governed by presbyters or elders. Presbyterian congregations are representational, that is, the congregation elects qualified men (see: 1 Timothy 3, Titus 1, and 1 Peter 5) to deliberate and oversee the ministry of the church in its behalf. Elders are nominated by the congregation after which each candidate trains and studies to prepare for examination by the Session, and if approved, election by the congregation the following year. The elders’ authority is collective, and they function properly when they serve “in session”, thus the body of elders is called the Session. The Session usually meets monthly and is available to pray with members, provide counsel, and assist GPC members in their walk with Jesus Christ. The current Session is: Larry Clagett; Jim Plybon; Kevin McClain, Clerk of Session; Randy Edwards, Moderator. The Diaconate is a ministerial body within the congregation which, under the supervision of the Session, oversees the congregation’s material resources and leads the congregation in mercy ministries and service. The current Diaconate is: Jim Dougherty, David Collins, John Hughes, and Doug Jewell. Both elders and deacons serve a life-long ministry within the congregations to which they are called. Each serve for three consecutive years followed by a year-long sabbatical. At the conclusion of their sabbatical, each stands for re-election before the congregation.